a positive real 'rate' ; sometimes the scale , the inverse of the rate is used. 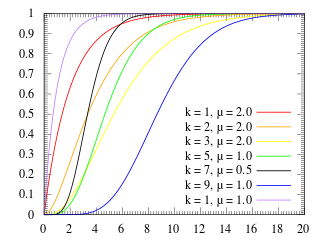 The Erlang distribution with shape parameter equal to 1 simplifies to the exponential distribution. It is a special case of the Gamma distribution. It is the distribution of a sum of independent exponential variables with mean each. The Erlang distribution was developed by A. K. Erlang to examine the number of telephone calls which might be made at the same time to the operators of the switching stations. This work on telephone traffic engineering has been expanded to consider waiting times in queueing systems in general. The distribution is now used in the fields of stochastic processes and of biomathematics. The parameter k is called the shape parameter, and the parameter is called the rate parameter. When the scale parameter equals 2, the distribution simplifies to the chi-squared distribution with 2k degrees of freedom. It can therefore be regarded as a generalized chi-squared distribution for even numbers of degrees of freedom. Because of the factorial function in the denominator, the Erlang distribution is only defined when the parameter k is a positive integer. In fact, this distribution is sometimes called the Erlang-k distribution (e.g., an Erlang-2 distribution is an Erlang distribution with k = 2). The gamma distribution generalizes the Erlang distribution by allowing k to be any real number, using the gamma function instead of the factorial function. 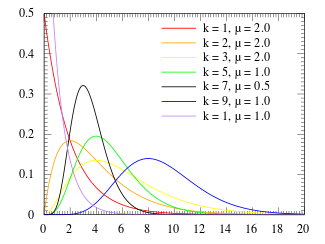 An asymptotic expansion is known for the median of an Erlang distribution, for which coefficients can be computed and bounds are known. An approximation is , i.e. below the mean . The Erlang distribution, which measures the time between incoming calls, can be used in conjunction with the expected duration of incoming calls to produce information about the traffic load measured in erlangs. This can be used to determine the probability of packet loss or delay, according to various assumptions made about whether blocked calls are aborted (Erlang B formula) or queued until served (Erlang C formula). The Erlang-B and C formulae are still in everyday use for traffic modeling for applications such as the design of call centers. It has also been used in business economics for describing interpurchase times. Erlang B distribution: this is the easier of the two, and can be used, for example, in a call centre to calculate the number of trunks one need to carry a certain amount of phone traffic with a certain "target service". Erlang C distribution: this formula is much more difficult and is often used, for example, to calculate how long callers will have to wait before being connected to a human in a call centre or similar situation. The Erlang distribution is the distribution of the sum of k independent and identically distributed random variables each having an exponential distribution. The long-run rate at which events occur is the reciprocal of the expectation of , that is . The (age specific event) rate of the Erlang distribution is, for , monotonic in , increasing from zero at , to as tends to infinity. The chi-squared distribution is a special case of the Erlang distribution. ↑ Choi, K. P. (1994). "On the medians of gamma distributions and an equation of Ramanujan". Proceedings of the American Mathematical Society. 121: 245–251. doi:10.1090/S0002-9939-1994-1195477-8. JSTOR 2160389. ↑ Adell, J. A.; Jodrá, P. (2007). "On a Ramanujan equation connected with the median of the gamma distribution". Transactions of the American Mathematical Society. 360 (7): 3631. doi:10.1090/S0002-9947-07-04411-X. ↑ Jodrá, P. (2012). "Computing the Asymptotic Expansion of the Median of the Erlang Distribution". Mathematical Modelling and Analysis. 17 (2): 281–292. doi:10.3846/13926292.2012.664571. ↑ Cox, D.R. (1967) Renewal Theory, p20, Methuen.